Anywhere and everywhere: With Montana’s new ruggedized design there is no longer a need to hold back, regardless of your adventure. Montana is fully waterproof and capable of withstanding all the mud and grit you can throw at it, even when connected to its optional powered mount. Use the power mount capability and City Navigator® for spoken, turn-by-turn driving directions, or the rugged mount for your motorcycle or ATV. If you are on foot, simply plug headphones into Montana’s 3.5mm audio jack to hear the spoken prompts. 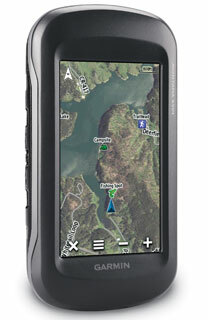 To see Montana in action go to, http://sites.garmin.com/montana/. Stay powered: Montana offers two battery options to keep your device powered during remote hunting trips or other outdoor adventures. When you have a chance to rest and recharge each night, a thin, light weight lithium ion battery pack, lasting up to 16 hours, comes in the box. For those trips where you’re off the grid, Montana also works on three AA batteries, giving users an additional 22 hours of use without being weighted down.